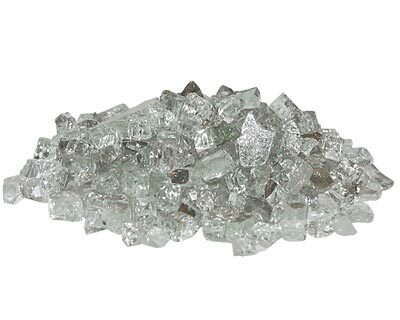 Add a dazzling look to your fire pit or hearth using this Panacea Clear Fire Glass. Using tempered glass, rather than wood, in your fireplace helps evenly direct and retain heat, and this generous container covers plenty of area. These clear pieces showcase the beauty of your fire or can evoke ice, and their reflective finish aids in spreading the light from the flames. The non toxic, tempered glass will not burn, melt, create ash or smoke, and is also fantastic for covering the plumbing lines in your propane hearth. Each piece measures approximately 0.25", and the 25 pound container is wonderful for use in several shapes of fire pits. Create contrast and style in your hearth or fire pit with this Clear Fire Glass.